Warm, well-drained soil enriched with composted manure or other rich compost. Needs more nitrogen than other vegetables. Mix an organic fertilizer into the soil before planting, following label application rates. When tassels form, feed plants second time. Beans, Dill, Marigold, Sunflower, Cucumber, Melon, Peas and Squash. Wait until the soil is warm to sow sweet corn. Soak seeds in water overnight before planting them 1 inch deep and 6 inches apart. Thin to 12 inches apart when the plants are 6 inches tall. Plant in blocks of at least 15 plants, all the same variety, to insure good wind pollination. Keep well watered in dry spells. 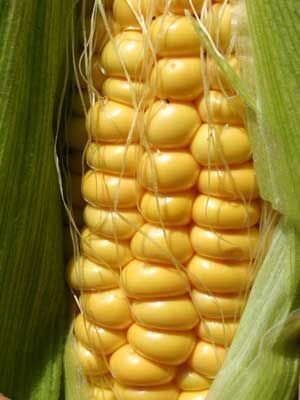 Sweet corn is ready when the ears feel firm and full when grasped, and a test kernel pierced with a fingernail released milky juice. Harvest in the morning, and promptly refrigerate ears to help them hold their delicate sugars. Corn earworms often feed in ear tips. Snap off the damaged part as you husk your sweet cork. Sweet corn germinates poorly in cold soil.